Karen Miranda Abel’s Liminal Refugia is an atmospheric, embodied reflection on the deep time interrelationships between earth (stone), water (rain) and fire (sunlight) that manifest in the ancient Triassic sandstone caves of Australia’s Greater Blue Mountains UNESCO World Heritage Area. 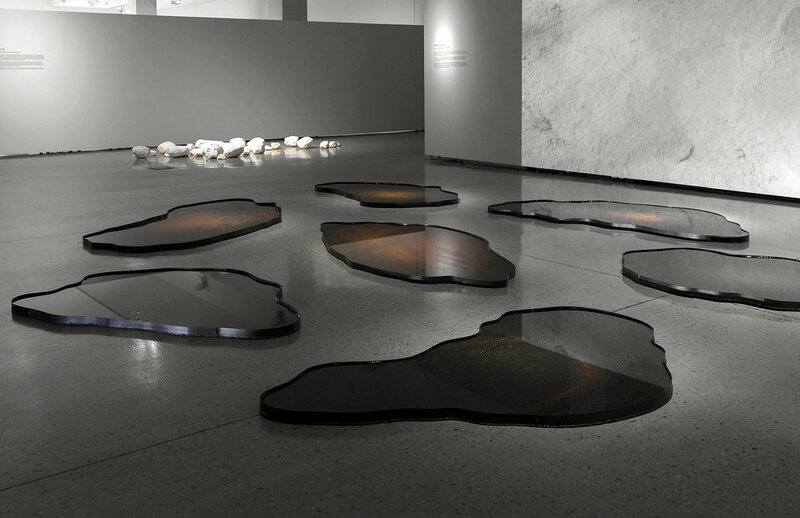 Highlighting the stability and mysterious purity of these timeless, shrouded ecologies, Abel invites visitors to navigate a sense of temporal elemental refuge—time travel in terrestrial stillness—through resonance in grounded moments of contemplation and visualization about geologic time. Also known as rock shelters, the shallow sandstone caves of the Greater Blue Mountains differ from deep limestone caves, such as the renowned Jenolan Caves, as they do not possess what is defined in speleology as a “dark zone.” Beyond the undulating portal at the cave mouth, these spaces house what is known as a “twilight zone.” This liminal quality of light and space conjures a sensation of an in-between state—suspension between worlds, between times—in the crepuscular glow of these cloaked environments. Through visitation to such a primeval threshold, it’s as if one momentarily stands in the footsteps of an irrecoverable distance of time, sustaining a prolonged glance at an overarching order of magnitude. Shielded from the elements yet created by them, the sandstone caves of the Greater Blue Mountains are mainly formed in the Narrabeen strata, sedimentary layers that tell the story of more than 200 million years of intricate and enduring geological history of eastern Australia’s Sydney Basin. Found at the bases and cliff edges of globally significant sandstone pagoda formations unique to the Greater Blue Mountains, these commanding geomorphic structures were sculpted over time by the slow movement of water through stone. This process of cavernous weathering etches the quartz grains from the absorbent sandstone body. Like a mythic hourglass, waves of time gradually deposit a soft mineral bed; a bone-dry beach harboured beneath the cave’s protective stone arch. In the rugged Australian bushland, these stone chambers have offered asylum from oppressive heat, bush fire, prevailing winds and storm events for millennia, constituting vital refugia for humans and wildlife such as the Rock Ringlet Butterfly, Rock Warbler, Superb Lyrebird, Masked Owl, Eastern Cave Bat, Black Rock Skink and Common Wombat. The dry, shielded nature of these ecospheric interiors have similarly safeguarded galleries of Aboriginal art created on the walls of a great number of Blue Mountains caves hundreds or thousands of years ago—an aspect which continues to shelter the vibrancy of these significant art works today. At present, many sandstone caves and encompassing bushland areas are increasingly at risk of being forever changed by large-scale anthropogenic disturbances. Outside of national park boundaries, the impact of underground fossil fuel extraction in unprotected regions of the Greater Blue Mountains shifts the landscape corpus, causing deep vertical fractures that bisect and collapse massive stone pagodas and cliffs, subsequently draining rare hanging swamps and silencing gentle waterfalls. This dramatic image of irreversible destruction vividly contrasts with the protective shield that these same ancient stone structures have offered to delicate cave art works created by humans for millennia. In the seductive blaze of modernity, it can at times be a challenge to distinguish the sublime primordial rays from the smoldering carbon afterglow. Perhaps more imperative than ever are the reminders offered by intimate ecologies that transmit empathic echoes of past worlds and world-views; a humbling clarity in the penumbral twilight of liminal refugia to lift the veil of time. Glass, earth samples ethically collected from the Blue Mountains region of Australia by local residents and visitors as part of the GEODIVERSITY project. Permanent collection of the Blue Mountains Cultural Centre Art Gallery, Australia. A constellation of earth samples gathered by over 65 individuals in the Greater Blue Mountains was ground and finely sieved by the artist to create Veil of Time. Unravelling like a geologic time scale, a graduated array of minerals preserved in hourglasses symbolize the delicate formation of sandstone caves in which rainwater etches the quartz sandstone grains from the absorbent stone body, slowly releasing a shoreless beachscape onto the cave floor below. From December 2017 to February 2018, residents and visitors from the Greater Blue Mountains area were invited to be part of a participatory art project about the geodiversity of the Greater Blue Mountains World Heritage Area by filling a dry specimen envelope with a small sample of natural earth. To respect the fragility and intrinsic ecological and cultural values of the World Heritage Area, participants were asked to not gather samples from Aboriginal places or sacred sites, conservation reserves, flora reserves, national parks, state conservation areas, state forests or other nature reserve areas. The Earth’s mantle of soil—called the pedosphere—is the thin soil fabric that blankets the ground, consisting of natural bodies of mineral and organic compositions, which in the Greater Blue Mountains primarily consist of layers of sandstone, basalt and shale. Therefore, most of the earth samples received consisted of sand and clay. The term “geodiversity” refers to all non-biological elements that shape the Earth: the soils, stones, fossils, geological formations and landscape-forming processes that are the foundation for all living things, including human life on the grand geologic time scale. Geodiversity is intimately linked with biodiversity and is similarly affected by change. In the Greater Blue Mountains, geodiversity features include magnificent erosional elements such as caves, rock shelters, cliffs, slot canyons, bottleneck valleys and sandstone pagodas. These ancient forms possess intrinsic value even if they are not the habitat of significant ecosystems. In discussing the matter of geodiversity, it is essential to observe that this scientific term, as well as the English word “earth,” have only existed in the Greater Blue Mountains World Heritage Area for about 200 years. Whereas, six distinct Aboriginal language groups—Darkinjung, Darug, Dharawal, Gundungurra, Wanaruah and Wiradjuri—have been expressing and caring for Country in the region for tens of thousands of years. Words that communicate a diversity of complex concepts and intricate knowledge systems related to understandings of earth, stone and the ground in Aboriginal languages were spoken, shared and lived across this region, and in relation to specific bushland places, long before the word “earth” was first spoken here. In 2000, the Greater Blue Mountains were included on UNESCO’s World Heritage List on the basis of biodiversity, but not geodiversity due to insufficient evidence at the time. In Recognising New Values: The Geodiversity and Geoheritage of the Greater Blue Mountains (2015), Haydn Washington and Robert Wray reveal that recent scientific research of many geologists and geomorphologists presents a strong case for the Greater Blue Mountains to be officially recognized for meeting the criteria of outstanding universal values for both biodiversity and geodiversity. This confluence of earth samples in a public gallery space is a gesture in support of honouring the enduring existence of geoheritage values. A composition of stone sculptures evokes the interrelationship of water moving through stone in waves of deep time. A subtle watermark—created by partially soaking the cast sculptures in Blue Mountains rainwater—hints at the enduring capacity of sandstone to accept, hold and release water like a living, breathing entity. Drops of pigment added to the water revealed the invisible watermark, much like the ironstone capillaries of the Greater Blue Mountains. Through a watery journey of land and sea several hundred million years old, bands of iron oxide accentuate the majestic Triassic sandstone architecture of the Greater Blue Mountains. The cast gypsum was hand-mixed with local earth and sand samples collected by Abel on private property in Bilpin, Darug and Gundungurra Country. The forms originate from field stones found at her mother’s rural home in the Ottawa Valley, Canada, situated in Algonquin traditional territory at the base of the Canadian Shield. Cast in the Blue Mountains, Abel transformed the Canadian stone impressions into forms that channel the ethereal presence of some of the sandstone rock formations she encountered during bushwalks in Australia. In acknowledgement of her journey as a visitor to Australia, Abel has shared an essence of her home country landscape as a gesture of reciprocity for the invitation to create this site-sensitive body of work in the Greater Blue Mountains World Heritage Area. For over ten days, Abel spent a number of hours a day in a cave in the Wollemi National Park in Darug and Gundungurra Country, informally referring to the site as Oculus Cave. An oculus is a circular architectural opening to the sky in a domed ceiling or wall that creates an intense sunlight passage. The daily capsule of time invested at the site allowed for mindful listening to wildlife near and far, and prolonged contemplative observation of elemental cave phenomena such as the rare pools of light that navigate into the cave threshold like rudimentary reverse sundials. A “light pool” is Abel’s term for an ephemeral illumination created when the auric tone of Australian sunlight bleeds its way into the shallows of the chamber. These light artifacts shift and shimmer upon cave walls and floors, composing a dynamic light memory on stone. This primordial interaction of sunlight and mineral matter has likely repeated daily for thousands of years with only slight seasonal variations. Abel observed the crevices activated by light pools as they were investigated by butterflies, small skinks and a resident Rock Warbler (Origma solitaria). The distinct sound of this individual bird’s wings would echo throughout the stone interior with such frequency that Abel came to recognize it as an intrinsic aspect of the cave’s unique acoustic ecology. A series of elemental pools reference the undulating portals of seven individual caves in the Gardens of Stone region located in Wiradjuri Country. Locally known by bushwalkers as Michelangelo Cave, Rain Cave, Sand Cave, Cathedral Cave, Acoustic Chamber, Dome Cave and Cosmic Cave, several of these magnificent stone formations are located in unprotected bushland currently threatened by coal mining. The shape of each sculpture is derived from Abel’s personal perspective while situated within the spatial interior of the cave looking out; whereas the gallery visitor is offered the sensation of being outside the cave opening looking in. Generating this meeting point of perceptual duality suggests a mirrored threshold—a liminal realm of physical and psychological geographies. The sculptural merging of mineral and water embodies the fundamental relationship between rock and rainwater in cave formation. These geomorphic forms are carved by thousands of years of the slow movement of water through stone. The sculptures were left outside for a period in Blue Mountains bushland exposed to the region’s heavy rainfall and intense southern hemisphere sun to obtain a natural iron oxide patina, creating a distinct colouration reminiscent of the ironstone layers that characterize Triassic sandstone. As the 2017-2018 Blue Mountains Cultural Centre World Heritage Artist in Residence, Abel’s site-sensitive field research practice for the culminating solo exhibition Liminal Refugia emerged out of three visits to Australia. This research period constituted over 150 days of living and working in the Blue Mountains from the large studio at Bilpin international ground for Creative initiatives. Abel traversed to more than 20 exemplary sandstone caves hidden deep in the distinct pagoda formations of Wiradjuri, Darug and Gundungurra Country. These remarkable sites are situated in the Gardens of Stone and Wollemi National Parks as well as the vast unprotected bushland that lies seamlessly outside of the boundaries of these two official reserves. As part of a commitment to forming an understanding of the fortitude and fragility of the sandstone caves of the Greater Blue Mountains, Abel invested a period of solitary time in a selection of caves as an intimate study of place, spending many consecutive hours at some remote sites. The hours transpired like minutes in the static cave environment where Abel experienced the form and quality of “twilight zone” light instilled in each stone interior, often wondering when was the last time a human – a woman – spent a similar amount of time in the same cave, if ever. Abel wishes to express respect to the Elders, individuals, families and communities of the six Aboriginal language groups – Darkinjung, Darug, Dharawal, Gundungurra, Wanaruah and Wiradjuri – who are the original and continuing Custodians and Carers of Country in the Greater Blue Mountains World Heritage Area.